All 33 of Burnley's claret and blue shirts over the past 100 years went on display along with shirt number 34 which was launched at the exhibition ahead of the next season. Here we show that shirt and the two that have followed it. 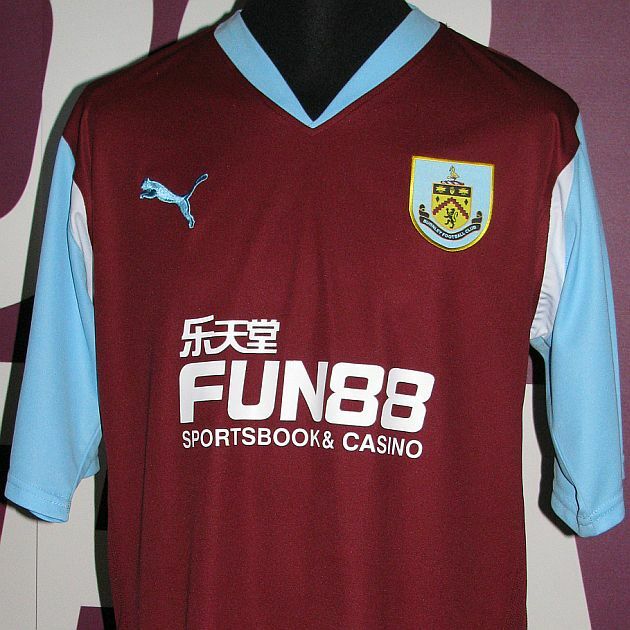 The 2010/11 shirt came with a new manufacturer (Puma) and a new sponsor in FUN88. The shirt wasn't too far removed from that of the previous season although it had a more modern looking V neck and had flashes of white at the top of the sleeves and at the bottom of the shirt. The big change was with the club badge. Expected to return to the club badge that had first been released in 1973, the club instead opted for a new badge based on the old Coat of Arms that had been used in the previous season. One of the main changes to the badge was the oft misinterpreted Latin inscription 'Pretiumque et Causa Laboris' being replaced with the words 'Burnley Football Club'. The shirt was worn at home with white shorts and again featured claret and blue hooped socks. The 2011/12 shirt saw the return of a collar to the shirt for the first time since the 2006/07 season. 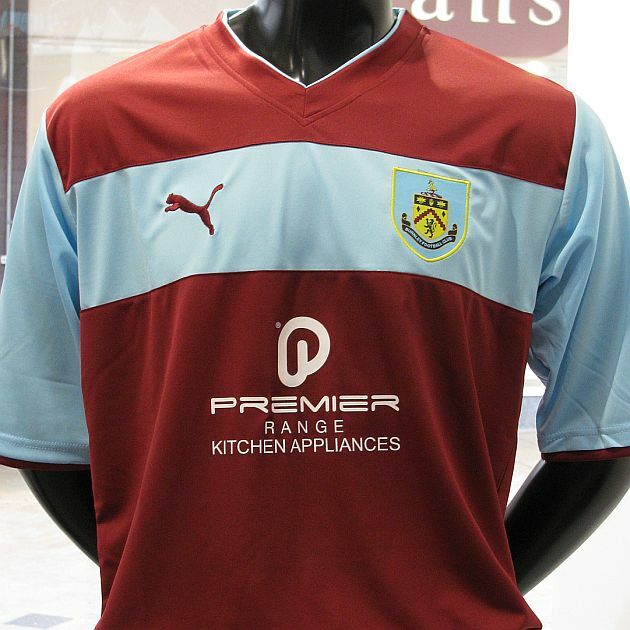 It was a traditional Burnley shirt of claret body and blue sleeves with claret trim. However, it was also a standard Puma 2011/12 design and carried two blue bars across each shoulder. 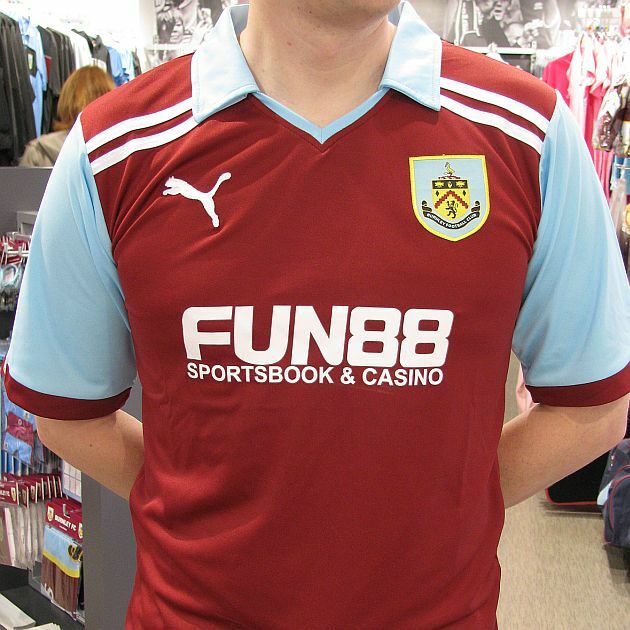 The FUN88 logo was slightly amended and the overall kit saw a return for the white socks after two years with claret and blue hoops. The shirt for the 2012/13 season certainly brought with it some debate as we introduced a shirt with a wide blue bar across the front which carries both the Puma logo and the club badge. FUN88's sponsorship has ended and been replaced by Todmorden company Premier Range. Other than that, the shirt carries a reasonably traditional look with the claret body and the blue sleeves although the returning V neck is claret with just a thin blue piping. The biggest change of all has seen both the white shorts and socks dispensed with. The main colour for both shorts and socks is blue, the first time the club have worn these colours since the 1979/80 season.